An inferno swept through the Kilinochchi market on the night of September 16. Desperate calls had been given to all quarters. The town had no fire service. The nearest was the Jaffna Municipal Council’s fire brigade, almost 1 ½ hours away. By the time it arrived, over 120 shops had been gutted. There was agreement that the damage could have been contained had there been a firefighting unit in the area. The Government last month allocated Rs. 97 million for a modern fire brigade for the Kilinochchi district. But many other parts of the country remain at risk still. 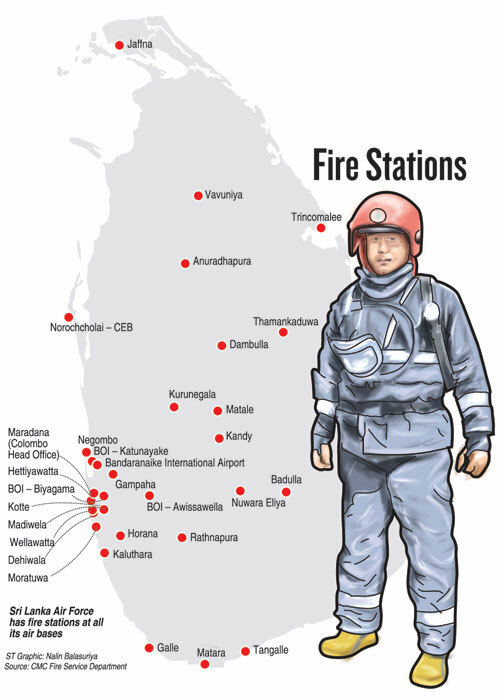 The country has fewer than 40 fire stations, statistics from the Colombo Municipal Council’s (CMC) Fire Service Department show. Several of these are designated to specific locations such as industrial zones, oil storage facilities or the coal power plant. They rarely respond to outside emergencies. More than half of all civilian fire stations are in the Western Province. The Southern and Central Provinces each has three stations. The Northern, North-Western and North-Central Provinces have two each. The Sabaragamuwa, Uva and the Eastern Provinces have just one station each. The Sri Lanka Air Force (SLAF) has units at all of its air bases and are often the first to respond, particularly when there is a fire in the vicinity of a base. Sri Lanka’s fire services are crippled by a shortage of financial resources, equipment and qualified firefighters, the lack of a mechanism to enforce fire safety regulations and apathy among relevant officials, the Sunday Times learns. It is the responsibility of respective local authorities to establish and maintain fire departments. As far back as 1999, the Report of the Commission of Inquiry on Local Government Reforms observed that there had been considerable losses due to lack of firefighting facilities and equipment. 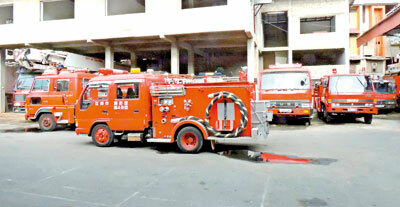 It strongly recommended a countrywide network of efficient firefighting units. But progress has been excruciatingly slow. There is no central coordination of firefighting operations, resulting in loss of valuable time during disasters. The CMC Fire Service Department advertises a “110” emergency hotline but even this is not a central coordination unit. There is no law to empower fire service officials to enforce safety rules. When conducting a risk assessment of a building, therefore, a fire prevention inspector may only advise people to rectify any shortcomings he has identified. If his counsel is ignored, there is no legal recourse. The Construction Industry Development Authority (CIDA) is drafting new regulations on fire safety for building sites, he said. But the CIDA is not an enforcing authority. Regulations must be enforced by someone–ideally the Fire Services Department–but this is impossible without any legal teeth. Fire services professionals have tried to convince successive governments to adopt a Fire Services Act, to no avail. Mr Kannangara put it down to a lack of political will. Local authorities do not want to forfeit their powers, he added. But the central government must play a direct role in fire services as local authorities cannot handle these on their own, he insisted. It was impractical for all local government authorities to have a fire station. So there was a dire need for a central unit to coordinate fire and emergency services. A central coordination unit is all the more vital, with the Western Province soon to be transformed into a megapolis. The ideal mechanism, Mr. Kannangara said, would liaise among provincial fire stations under supervision of a Director of Fire Services attached to the Ministry of Provincial Councils and Local Government. Some local authorities were better funded. But most faced serious challenges in running a costly operation such as a fire station, said Jayaweera Madigasekera, Fire Consultant and President of the Institution of Fire Engineers (Sri Lanka) Branch. Even a firefighter’s helmet costs Rs. 20,000. It was no wonder, then, that many local authorities were struggling to maintain their fire departments. Mr. Madigasekera, who was once in the fire service, said a large number of firefighters were from rural areas and were ill-equipped and poorly trained. Many of the vehicles they used were also outdated. The staff shortage in some stations is so severe that any local authority driver is permitted to drive a fire service vehicle despite this being prohibited, said former firefighters. A 2009 circular issued to Provincial Chief Secretaries by the Provincial Councils and Local Government Ministry says: “People who are not Fire and Rescue Officers are strictly prohibited from driving vehicles under this service and can be held accountable.” This is because fire-and-rescue drivers need added skills such as maintaining correct water pressure during firefighting efforts. Some local bodies even divert funds meant for fire services to “more priority” areas. Provincial Councils and Local Government Ministry Secretary H. T. Kamal Pathmasiri acknowledged that the absence of an enforcing mechanism for fire regulations was an impediment. He admitted that there weren’t enough fire stations. However he said that the government is now working on a national policy for local authorities. Setting up fire stations in urban areas would receive particular attention. But he could not say when either would be completed. 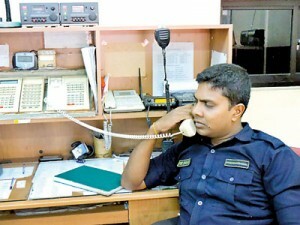 Prank calls are a serious problem for those manning the control room of the CMC’s 24-hour fire service. Not only are they a nuisance but the line is often blocked by these calls. Not too long ago, officers received nearly 260 calls over three hours on the “110” toll free emergency hotline. They were all from one number. While the department usually ignored most prank calls, the sheer volume from one number caused them to alert the police. The calls were traced to a person in Angunukolapelessa whose three children had used his phone to annoy the firefighters. The CMC’s Fire Department responds to an average of 300 fire calls a year. It has 300 firefighters in six stations. It is the best equipped unit in the country but even this department depends on various project aid to update equipment and technology. Most of its best equipment was received through a Netherlands-funded initiative a few years ago. The ideal response time to a fire call should be around eight minutes. Traffic congestion in the city raises this to around 15 minutes. It takes longer to reach areas outside CMC limits. This made it doubly important to introduce more fire stations and more coordination among units. A key challenge faced by firefighters was obstruction by the public, they say. Some want to see the fire. Others want to help. But in both instances, they do more harm than good.